Now that we are back to homeschooling I feel like a chicken with her head cut off. I go from breakfast, to school work, back to the kitchen for lunch, more school work, snack time, errands, and then back to the kitchen for dinner. Needless to say my time in the kitchen is pretty lengthy. 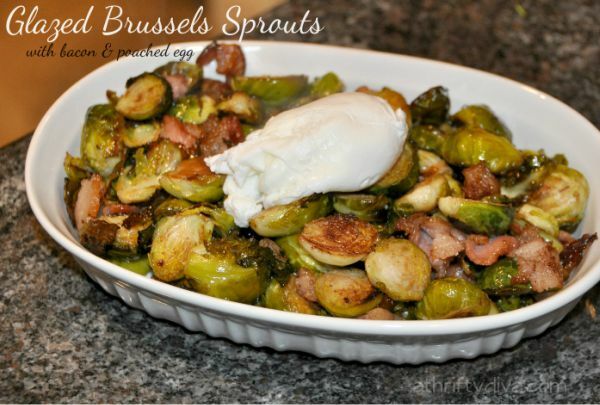 I am constantly trying to come up with simple crowd pleasers for my family of five. And the less amount of time I can spend in the kitchen, the better! I also am a huge fan of buying in bulk. I do my grocery shopping at Sams Club, where I can plan meals two weeks in advance. Sam’s Club is also the perfect place to get ideas on quick meals. If you are a Sam’s Club shopper you are familiar with the tasty demos that happen in the food sections. 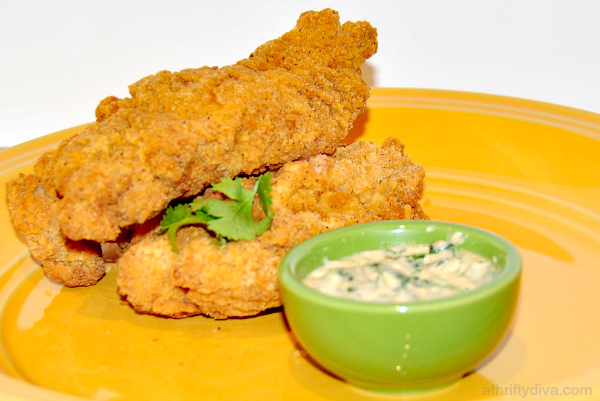 My boys love chicken and I usually find myself incorporating Tyson Crispy Chicken Strips into our meals each week. 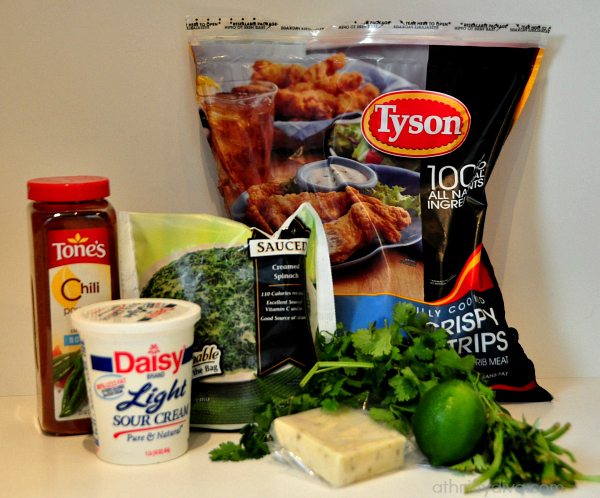 Yesterday I concocted what I think is the BEST Zesty Spinach Chili Cheese Dip EVER to go with Tyson Crispy Chicken Strips. 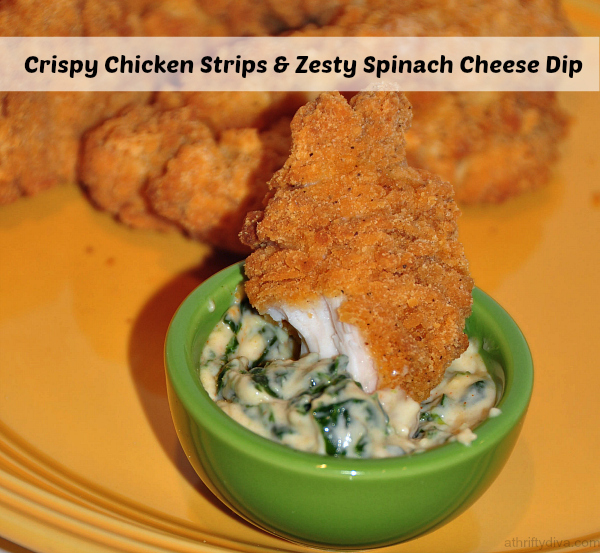 For last nights dinner I wanted a zesty dip to go with our chicken strips and I love cheese and spinach style dips. So I incorporated pepper jack cheese, creamed spinach (look in the vegetable freezer section I found the 5 minute microwaveable bags to be perfect), chili powder, lime juice, sour cream and cilantro. Start by popping Tyson chicken strips in the oven for 20 minutes. Cook creamed spinach according to package directions. 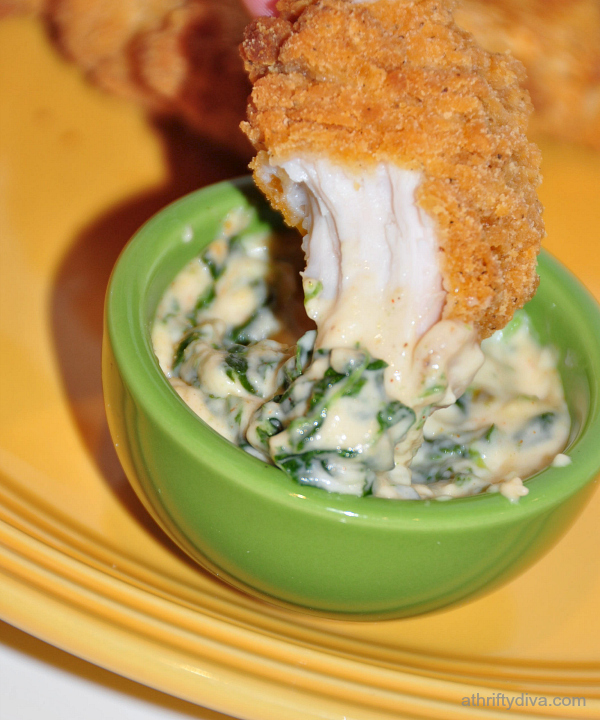 While the chicken strips are heating up start your dip. 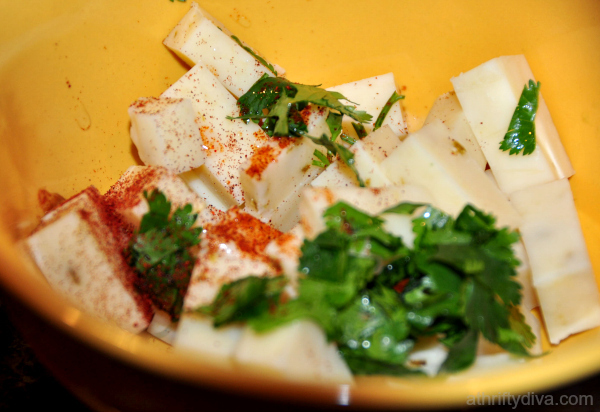 Take a block of Pepper Jack Cheese, dice it up and place in a microwave safe bowl. 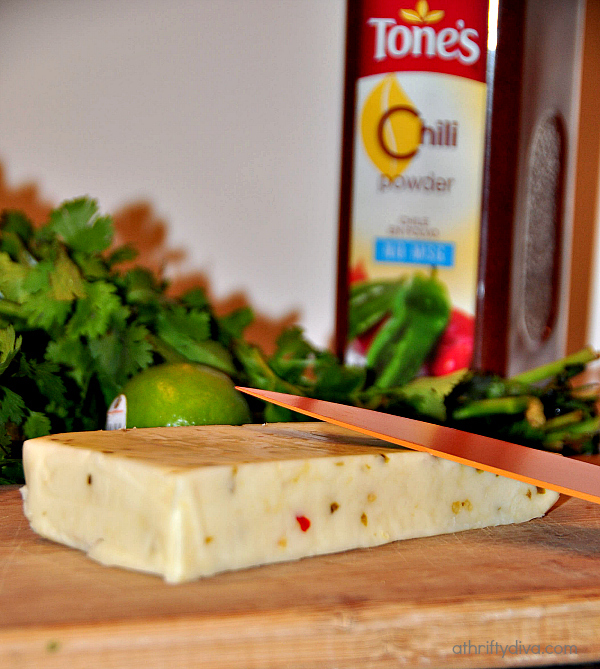 Add in 1 tablespoon Tones chili powder, 1 handful chopped cilantro, juice of 1/2 a lime. Place in the microwave in 2 minute intervals mixing in-between until cheese is melted. Once cheese is completely melted add in 1/2 cup of sour cream and hot creamed spinach. 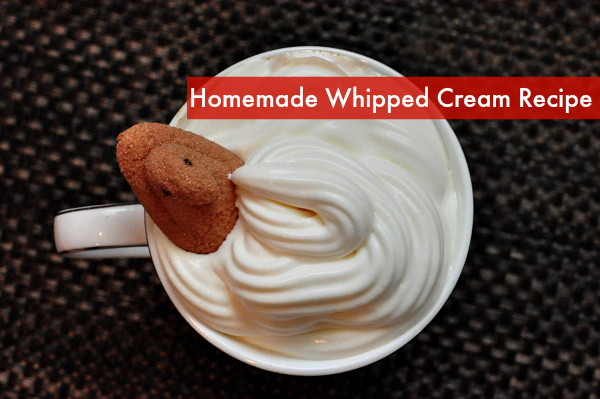 Mix dip until creamy and place in individual serving dishes. Plate and serve. 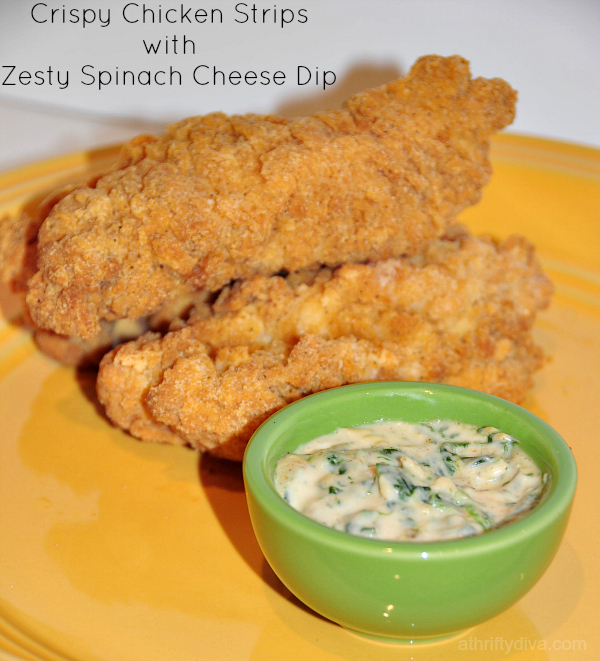 The Zesty Spinach Chili Cheese Dip is amazing with the crispy chicken strips. A perfect crowd pleaser. Cook Creamed Spinach according to bags directions. While Spinach is cooking, cut pepper jack cheese into chunks and place in microwaveable bowl. Add in 1 tablespoon chili powder, 1 handful chopped cilantro, juice of 1/2 a lime. Place bowl in the microwave in 2 minute intervals mixing in-between until cheese is melted. Once cheese is completely melted add in 1/2 cup of sour cream and hot creamed spinach.